March 2018 - BenchMark welcomes a new advisor to the region in Pennsylvania. Kraig Cawley joined BenchMark in March of 2018. Kraig is working in the Sewickley HQ office. He comes to us from Cambridge Financial and brings with him over 10 years of experience. We welcome Kraig and his clients to our region. April 2017 - BenchMark welcomes a new advisor to the region in Virginia. Keith Tucker joined BenchMark the last week of April 2017. Keith joins us from Ameriprise Financial and brings with him over 19 years of experience. Keith is located in Reston, VA. We welcome Keith and his clients to our region. February 2017 - BenchMark welcomes new advisors to the region in Florida. Bill Howard and Jeff Clark joined BenchMark in the latter part of February 2017. Bill and Jeff come to us from MML Investor Services. Together they have a combined 35 years of experience. They are opening the BenchMark South Florida office located in Ft. Lauderdale, FL. We welcome them and their clients to our region. December 2016 - BenchMark welcomes new advisors to the region in Florida, New Jersey and Michigan. Shawn Everett, Joseph Perri and Joseph Pezzillo joined BenchMark region at the end of 2016. They came from Omega Advisor Network. They all have over 15 years of experience. Shawn Everett comes to us from Florida, Joseph Perri from New Jersey and Joseph Pezzillo from Michigan. We welcome them and their clients to our region. November 2016 - BenchMark welcomes a new advisor to the region in Florida. Keith Heritage joined BenchMark mid November 2016. Keith comes to us from Gradient Securities. He joins his father Ken Heritage who joined BenchMark in 2015. Keith brings over 10 years of experience and is located in Newberry, FL. We welcome him and his clients to our region. December 2016 - BenchMark welcomes new advisors to the region in Pennsylvania. Ronald Leuschen, Christopher Zeiders and Michael Brittain joined BenchMark in early December 2016. They come to us from Ameriprise Financial. Ron and Chris work together in Camp Hill and have over 26 and 18 years of experience, respectively. Mike is also located in Camp Hill, PA in a separate office. Mike has over 24 years of experience and plans to expand his office with more advisors. We welcome them and their clients to our region. May 2016 - Benchmark welcomes new advisors to the region in Ohio and Pennsylvania. Michael Kern and Vincent Gallagher joined Benchmark the first week of May, 2016. Michael is working in the Sewickley HQ office. He comes to us from PNC Bank and brings over 15 years of experience. Vincent opened a new office in Bridgeport, OH. Vincent has over 30 years of experience with various firms in Wheeling, WV. We welcome them both and their clients to our region. January 2016 Benchmark welcomes new advisors to the region in Florida and Maryland. David Rockwell and Patrick Moriarty joined Benchmark the week of Jan 4. David's office is in Cape Coral, FL. He comes from Sun Trust Bank and brings 15 years of experience. Patrick's office is in Columbia, MD. Patrick comes from Wells Fargo with 20 years of experience. We welcome David, Patrick and their clients to our region. Ron Balog joined Benchmark and will work out of the Sewickley office. Ron joins us with over 10 years of experience. Having a lifelong passion for finance, he became an advisor with the goal of helping families realize their financial dreams and pursue their vision of financial success. Garth Moreau joined Benchmark as we expand to Bokeelia, Florida. Garth has his office in Bokeelia, FL. Garth comes from Edward Jones with 7 years experience. Tom Garlic joined Benchmark as we expand to central Pennsylvania. Tom will work out of an office in Palmyra, PA. Tom joins us from Ameriprise Advisors where he worked for over 10 years. With his Certified Retirement Planning Counselor designation, he helps his clients plan for and enjoy their retirement. Before working as a financial advisor, he honorably serviced in the U.S. Military. George Hunter of Hunter Capital LLC, joined us in Columbia, MD. George brings over 15 years experience at Merrill Lynch and Morgan Stanley and we welcome him and his clients. Ryan Buckle joined Irving Financial Group in Bradenton, FL. Ryan worked at Edward Jones for over 5 years and is a welcome addition to the Irving Financial team. Before working as a financial advisor, he honorably serviced in the U.S. Military. Jim Moore joined the McDaniel-Knutson Financial Partners group in Lawrence, KS. Jim has experience at Wells Fargo Advisors and with a local benefits firm where he specialized in 401k plans. His experience in the benefits area adds important skills to the McDaniel-Knutson group. Sid Ruth of Franconia Insurance & Financial Services Inc. in Telford, PA joined the region after the Cetera acquisition. February 19, 2013 ---- BenchMark Financial Advisors Selected For "Largest Pittsburgh-Area Investment Services Firms"
BenchMark Financial Advisors of Washington, PA has been honored with a recognition byPittsburgh Business Times in its selection of "Largest Pittsburgh-Area Investment Services Firms." This special recognition appeared in the February, 2013 issue of Pittsburgh Business Times published by American City Business Journals. Regional Director, Tim MIller, from BenchMark Financial Advisors commented on the recognition: "This is quite an honor for us. The fact that Pittsburgh Business Times includedBenchMark Financial Advisors in its selection of "Largest Pittsburgh-Area Investment Services Firms," signals that our constant efforts towards business excellence are paying off. We are proud to be included in this recognition." BenchMark Financial Network, one of Pittsburgh’s largest investment services firms, Friday said it has appointed Timothy Miller regional co-director. Los Angeles-based Cetera Advisor Networks LLC, which provides financial support to BenchMark, is acquiring the regional practice over a five-year period, said Michael McCormick, BenchMark founder, who will serve as regional co-director. BenchMark employs 100 people, including 75 advisers, in six offices. 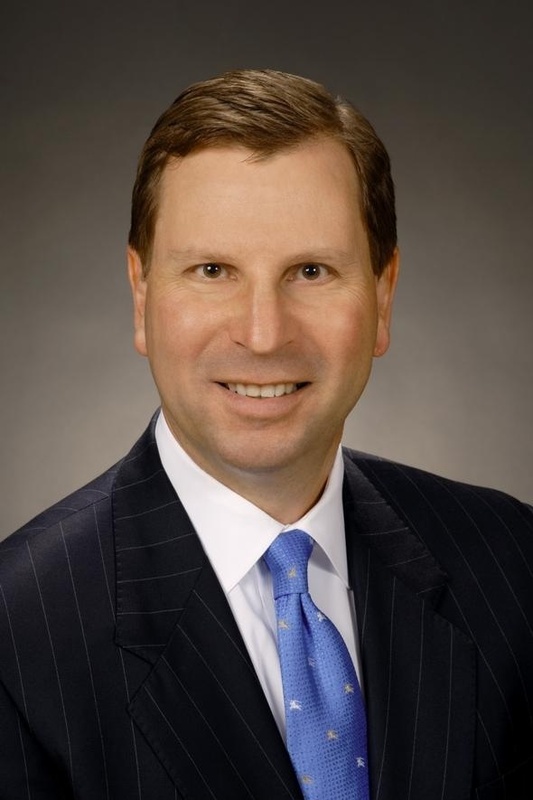 Miller joined the company from Wells Fargo & Co., where he most recently was responsible for growing the investment business within the private banking offices in the Pittsburgh and Philadelphia regions. McCormick said he is not retiring. “I have someone helping me to run the region,” he said. “I am realigning my personal activities to spend more time with my clients, children, grandchildren and church." 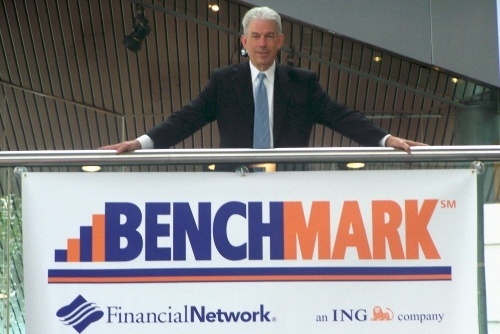 BenchMark adds 2 veteran Advisors. BenchMark Finanical Network announced 2 new advisors joined their team this week. 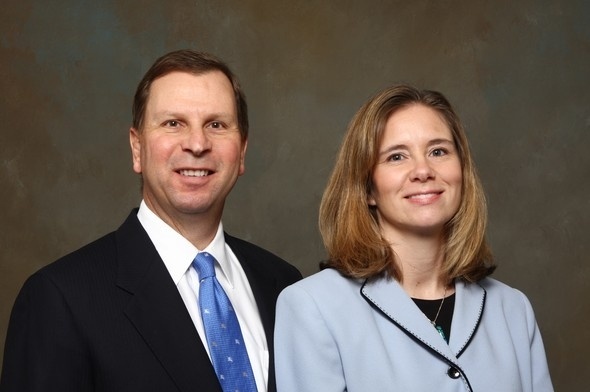 Stephanie Hunter and Tim Miller joined as a team from Wells Fargo Advisors at the end of November. Hunter has over 15 years experience at PNC Advisors and Wells Fargo Advisors. Miller is a 25 year veteran having worked at Merrill Lynch and Smith Barney. Miller has the Certified Investment Management Analyst certification from the Investment Management Consultants Association. Coming in at #4 on the list is BenchMark Financial Network with 105 advisors. C. Michael McCormick, top local executive, BenchMark Financial Network, has grown BenchMark year after year to consistently stay in the Top 5 spot. (JANUARY 2009) -- BENCHMARK SPONSORS OF THE PITTSBURGH BUSINESS TIMES' BOOK OF LISTS. RANKED AS THE #3 FINANCIAL SERVICES FIRM IN PITTSBURGH BY THE PITTSBURGH BUSINESS TIMES (RANKING BY SIZE -- NUMBER OF Cetera Advisor Networks LLC REGISTERED REPRESENTATIVES, JANUARY 2009), FIFTH STRAIGHT YEAR IN THE TOP FIVE. 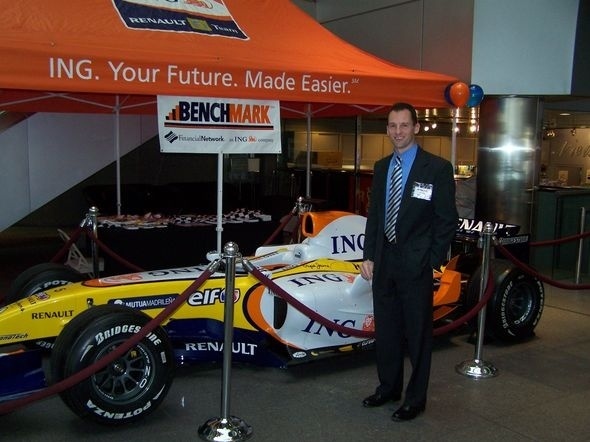 Bob O'Korn, who recently joined the downtown office of BenchMark Cetera Advisor Networks LLC, poses for a photo with the ING F1 Race Car, which was on display at One Oxford Centre on January 26, 2009, as part of the Pittsburgh Business Times 2009 Book of Lists Celebration. JULY 2008 -- BENCHMARK PRESIDENT & CEO MIKE MCCORMICK WAS THE SOLE RECIPIENT OF Cetera Advisor Networks LLC'S CHAIRMAN AWARD IN WASHINGTON, DC, GIVEN BY Cetera Advisor Networks LLC'S PRESIDENT, JACK HANDY. President & CEO Mike McCormick and the BenchMark Team -- Winner of the 2008 Cetera Advisor Networks LLC Chairman's Award -- July, 2008, Washington, D.C.
President & CEO Mike McCormick at One Oxford Centre, opened in August 2007 and expanded in September 2008; now located on the fourth floor just across from the Rivers Club. January 2017 - BenchMark welcomes a new advisor to the region in Delaware. Albert Minutola joined BenchMark in the third week of January 2017. Al comes to us from Questar Capital with over 19 years of experience. He is located in Wilmington, DE. We welcome Al and his clients to our region.